FUERTEVENTURA - SOTAVENTO -INCLUDING Instruction! - 6 hours and rental during course. 1 week staying in a self catering apartment 5 minutes walk to the beach with swimming pool including return flights and transfers. Amazing value! Departs selected dates in May - June - July 2019. RED SEA - EL GOUNA SPECIAL OFFER - SAVE £100PP! Departs LIMITED AVAILABILITY May 2019. CAPE VERDES SAL ISLAND - LAST MINUTE! Budget, boutique and beach hotels. Budget hotel 7 nights BB from £549pp, Boutique hotel with pool from £1,149pp from INCLUDING flights, transfer and VISA. 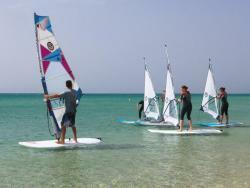 A short walk from the windsurf, kitesurf, surf, SUP and diving centres. MAURITIUS - LE MORNE 5* The St. Regis Mauritius SPECIAL OFFERS Junior Suite! Windsurf kitesurf surf or SUP with unrivalled luxury & bespoke service, a la carte dining, sublime spa and VIP sports service. FREE UPGRADES to Full Board + ROOM CATEGORY + KIDS Stay FREE. Departs selected dates in 2019.